One of the main reasons people dream of moving to the country and starting a homestead is so that they can really enjoy nature, appreciate it’s beauty, and own their own little piece of paradise. Urban homesteaders can still appreciate nature. However, it takes a little more pre-planning and travel than it might if you live on your own acreage. It’s a similar mind set as when utilizing the outer permaculture zones when on a small homestead. Luckily, most areas have many parks, national, and state forests and protected areas. 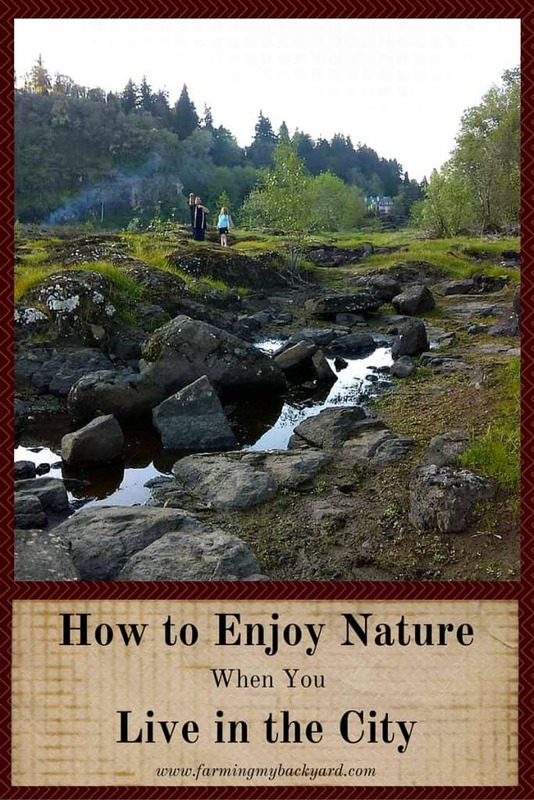 These are great places to go to appreciate the birds, trees, plants and natural beauties. The first place to enjoy nature is in your own backyard. By planting an organic garden and utilizing permaculture principles you create more habitat for birds, bees, and other critters even in the smallest lot. When we first moved into our 1/10th of an acre homestead the front yard was packed earth. The previous occupants had been parking cars on the lawn area! The backyard was covered with black plastic and bark dust. It was completely dead, you couldn’t even see ants or earthworms! Now, we walk into our yard and enjoy various plants and insects such as honey bees, bumble bees, preying manti, earthworms, rolli pollies, and ladybugs. There are even small critters such as toads, garden snakes, and many different species of birds. The first step in reclaiming a sparse habitation is building the soil. You can do that by mulching, planting cover crops, and adding lots of homemade compost. As your soil improves you can grow a larger variety of plants. This provides food and habitat for many beneficial and lovely critters. Many cities have natural areas right within their city limits! If you are new to an area, ask around and find out what the best spots are to visit. You can also look up local parks and green areas using Google Maps, or Discover The Forest. I typed in my zipcode on their front page and it pulled up many of my family’s favorite nature parks that we like to visit. You can even filter by which kind of activities you are hoping to do, such as fishing, hiking, or water activities. The picture featured at the top of this article is at Elk Rock, a small park smack dab in the middle of the river that runs through the center of Portland. So many places are hidden until you start looking for them! Sometimes if you travel a little farther from home you can be rewarded with spectacular views and experiences. When you have a homestead with animals it can be be hard to get away for overnight trips, but so much can be available in a day trip. For example, the ocean is a few hours away from us, too far to make it on weekdays, but on weekends it’s not that difficult to pack up the night before, give the animals extra food and water and leave for the day right after morning milking to enjoy a day in the sun (or clouds…since it is Oregon). This summer we are hoping to visit Mt. Hood in our area, as well as spend more time at the beach (my first love, as a California transplant). Urban homesteaders enjoy nature as much as their country counterparts, it only takes a to create our own mini habitats, enjoy the nearest parks and natural areas, or plan a day trip visit to some of the spectacular scenes and activities in your area. Great ideas! I’ve never heard of the website Discover the Forest before. Already used it and love it. Yes! It’s a cool little site. I’m lucky we have a lot of urban parks in my city, however I miss the outdoor activities from other places we’ve lived. I probably just need to do some more research on local places. Thanks for the idea and for posting on #WasteLessWednesday Blog hop! Yeah, we have some cool stuff, but we have to drive out of the city to find it. Sometimes it takes a while to find the “good” spots.